I love all shades of blue and turquoise, but there’s one particular shade that I can’t get enough of. Inky shades of blue-green just call to me. I don’t purposely seek out these colors, but there’s just something about them that I just can’t resist. It’s no surprise that I was drawn to Jitterbug by Country Chic paint. As soon as it came in the mail, I knew that it was perfect for a side table that I had in my garage. 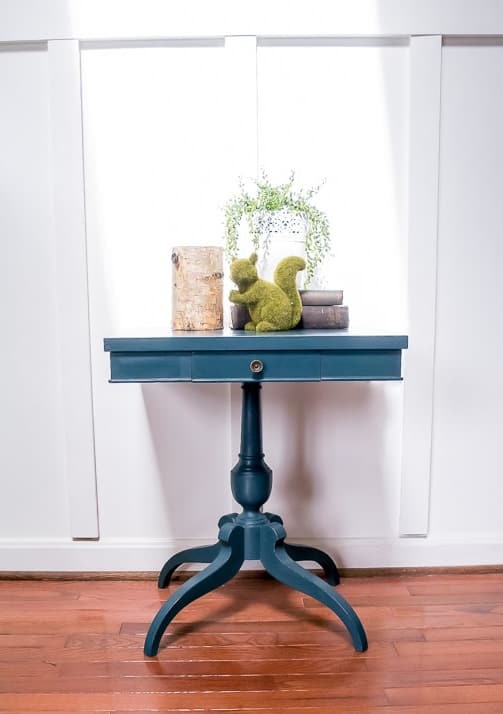 It was a cute table, but I knew that a beautiful paint color could make this table even better. 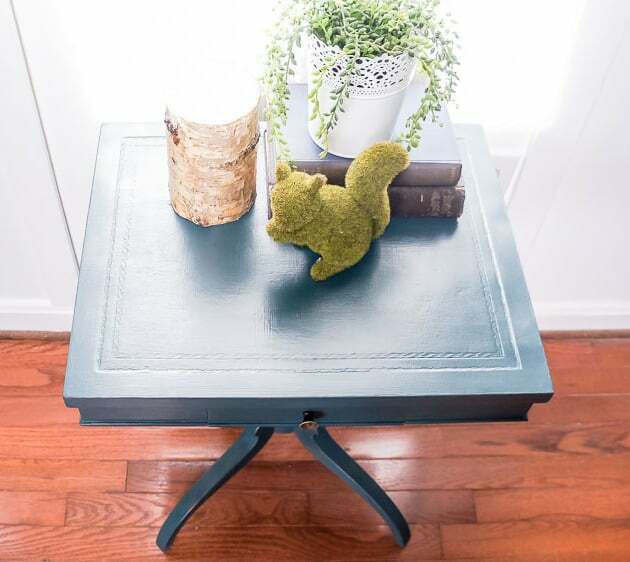 This painted side table is gorgeous now! My small side table wasn’t too bad to begin with, but red is not my favorite color. 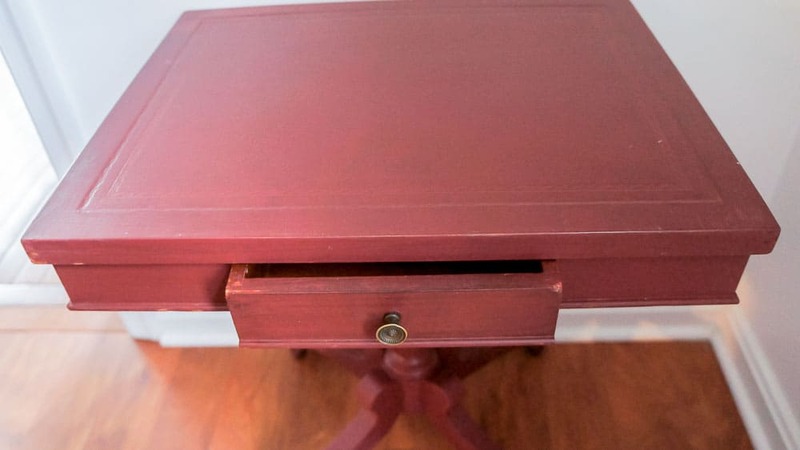 The table has a fun shape, nice legs and the cutest little drawer ever. 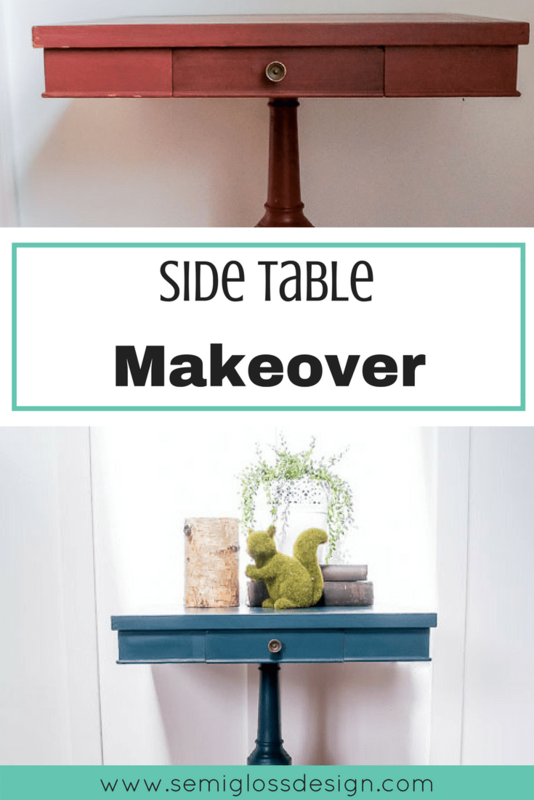 Side tables are one of my favorite things to paint because you can transform a piece of furniture in just a few hours. 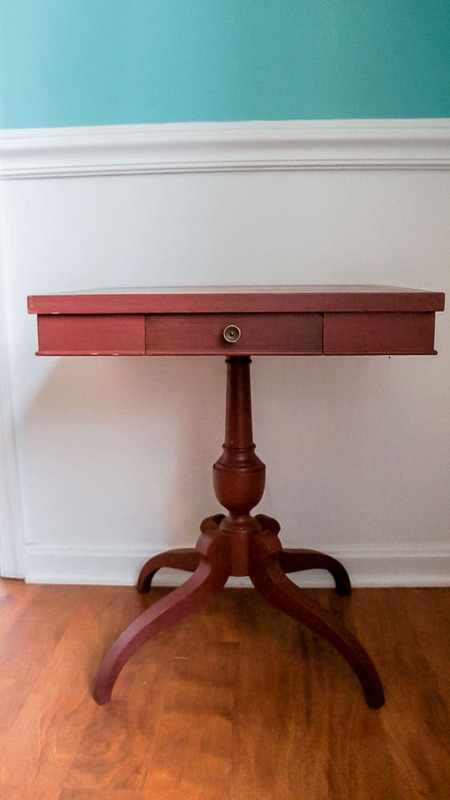 I also love the versatility of side tables since they can go in almost every room of the house. I gave it a quick wipe down and got to work painting it. The oval brush works great with small sample pots. Don’t forget to stir the paint well! The paint covered so well because the red was so dark to begin with. It was almost 1 coat coverage! 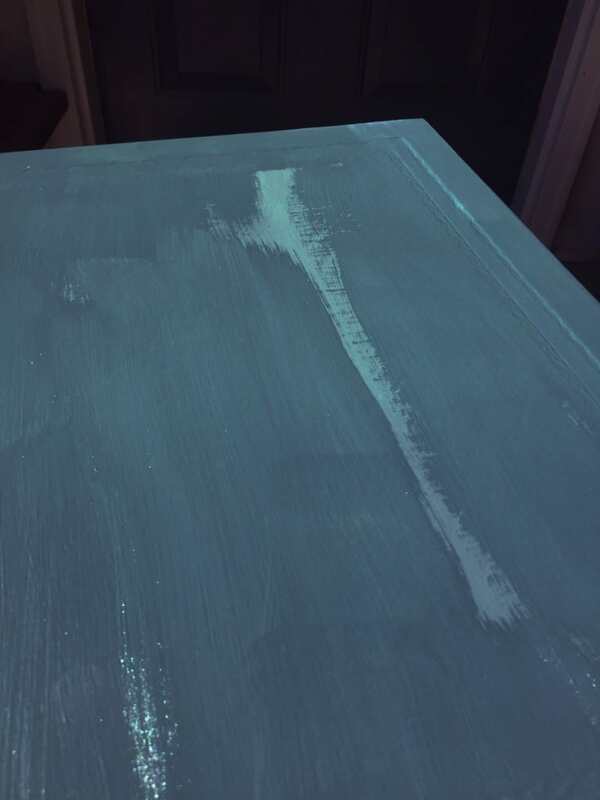 Painting over previously painted furniture is usually pretty easy. With tables like these, I start by flipping them upside down and painting that coat first. Once it’s dry, do any touch ups that are needed. Then flip it right side up and get any spots you missed, plus the top. One sample jar was more than enough for this table. I could probably finish 2 more tables this size with one jar. After the paint was dry, I finished the piece with Country Chic clear coat. We had a rare spell of warm weather, so I worked outside in the sunshine. The color looks weird because of that glorious sun, but it was worth it to get to sit in the warm sunshine. My side table got 3 coats of clear coat and now it’s gorgeous. I love how the clear coat doesn’t change the color, just enhances it. Country Chic Clear Coat works best when you use long brush strokes. This minimizes overlap that messes up your finish. Jitterbug is a nice color for people who might be a little bit color shy. It’s dark enough to feel like a neutral, but still feel interesting. It looks amazing with green. Jitterbug is the perfect, moody blue-green. What can I say? I’m in love. 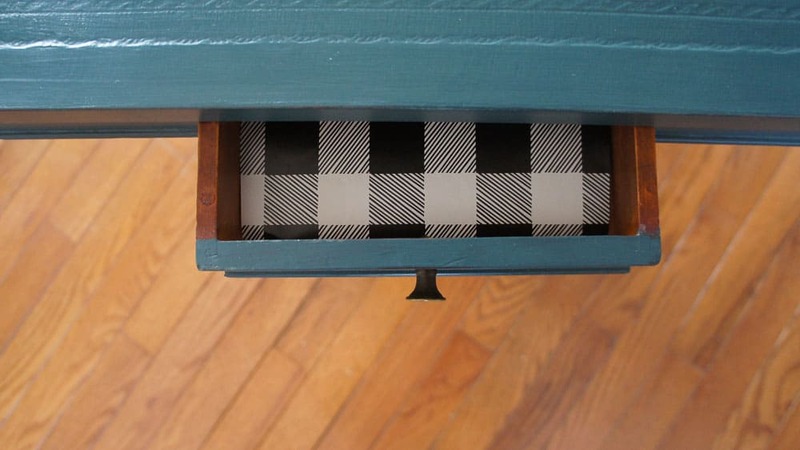 When the table was finished, I added buffalo check paper to the drawer. I had a small piece left over from the dresser that I just lined with it. My painted side table is stunning now! 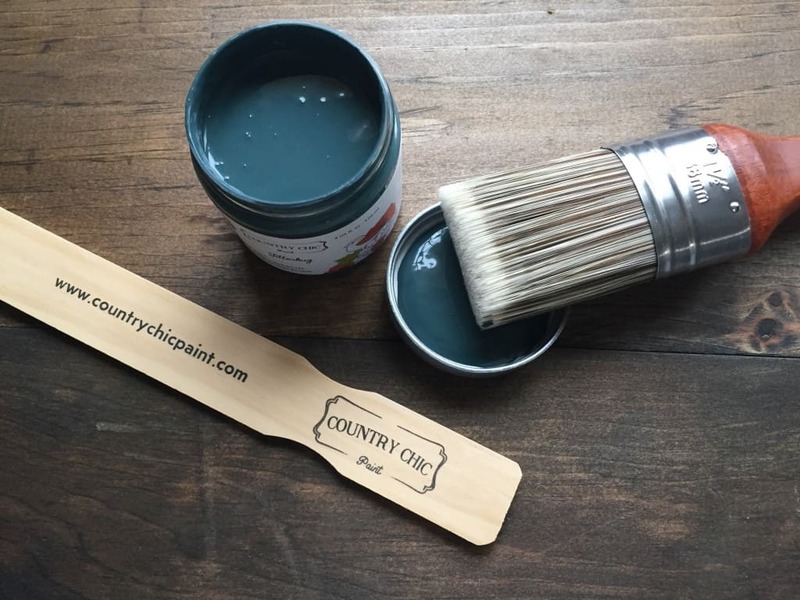 Be sure to check out Country Chic Paint! 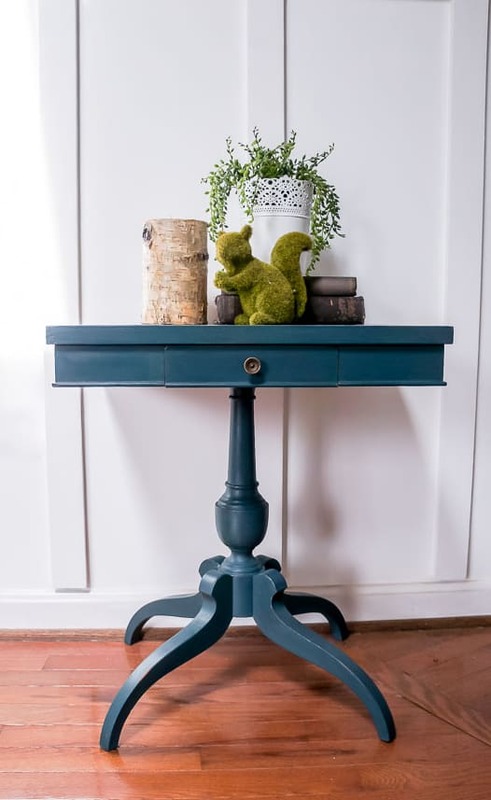 They have the prettiest color selection and you will love how easy this paint is to use. Their new Spring/Summer 2018 collection has me wishing that I hadn’t just redone my daughter’s room. Country Chic Paint has an awesome YouTube channel with tutorials if you like to learn through videos. They paint in the most amazing location, so check it out for serious eye candy. 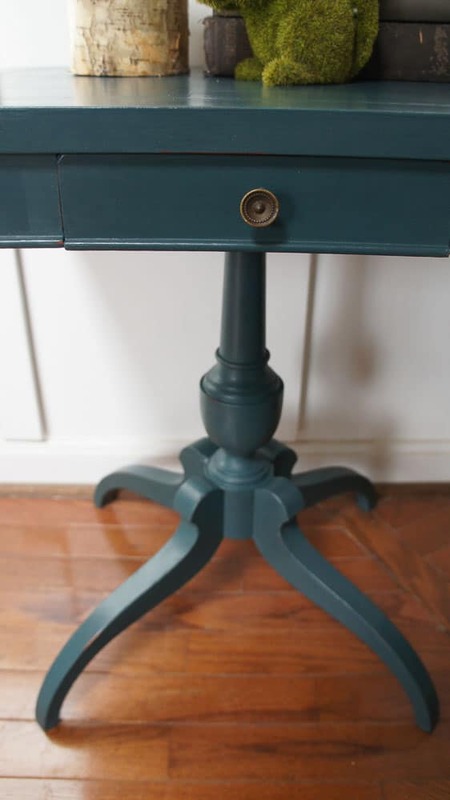 i love that dark teal- what a fun color! Thanks Cassie! I love this color too! What a pretty transformation! The first color was OK, but your makeover really stands out in a fresh and clean way. Pinned! Thanks Wendi! I’m in love with this color!